Out of all the gardens I've been to in the past few months, I'm surprised to say that Schreiner's Iris Garden has been my favorite. The diversity of colors and variety of flowers was absolutely stunning. And honestly it was just a very charming experience altogether. The garden itself is scattered with brightly colored tables, benches, and chairs and landscaped in such a way that there is no bad view. 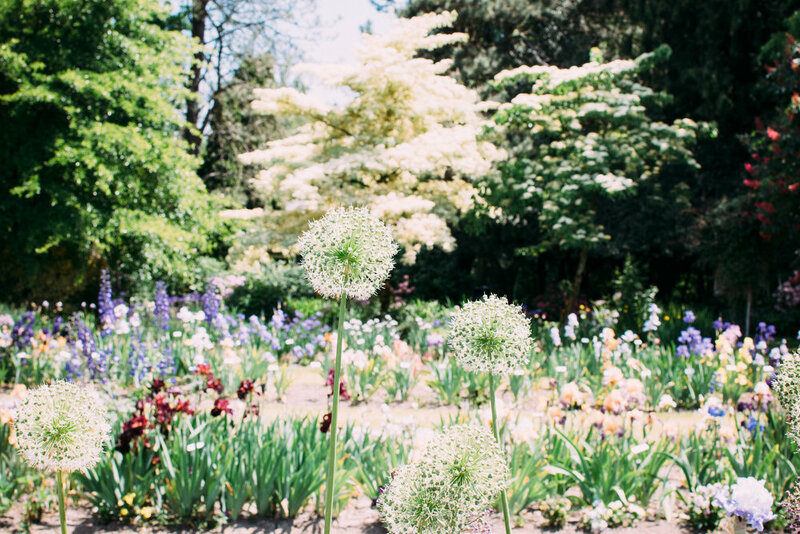 There's also a short walk through a forested area to a smaller garden of just irises. While we were there several people had brought picnic baskets and were eating lunch together just taking in the loveliness. Such a sweet idea and definitely something I'll do the next time around! Schreiner's was established in 1925 and sits on 200 acres of property right outside Keizer, Oregon. Ten of those acres are set aside as display gardens for the public. What made this experience unique from the other gardens I've visited is how the display garden was landscaped versus walking through fields of flowers in the dirt. I love that it wasn't just irises. They also had foxglove, peonies, rhododendrons, roses, lilies, and tulips to name a few. It really was a different experience than the others. I felt like I was walking through someones exquisite personal garden next to a sweet cottage in the country. As a girl who grew up loving The Secret Garden, it was magical. And while the iris isn't my favorite flower I think I found a new appreciation for it. Their gigantic yet delicate blooms really are a marvel and the range of colors are impressive. If you happen to find yourself in the Salem area, I definitely recommend grabbing lunch and heading over to Schreiner's. It's a great place to be distracted from the busyness of life and take the time to just be.